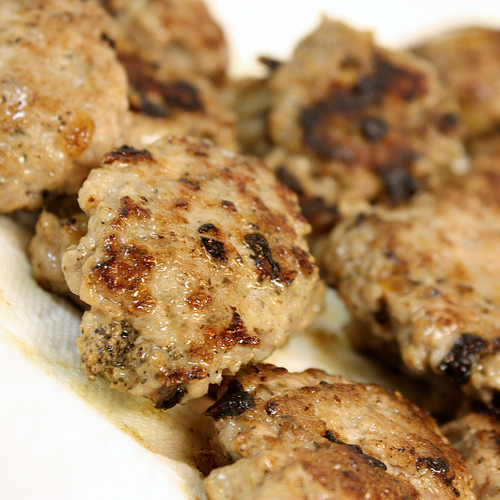 This pork breakfast sausage is delicious, easy to make in a huge batch (and freeze some for later), full of protein and flavor, and has helped me start several mornings off on the right foot so far. 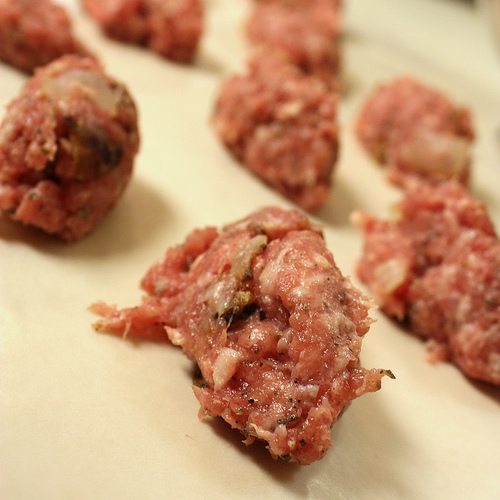 If you’re going to be using onion in your sausage, you’ll want to chop it into little pieces… probably smaller than I did. 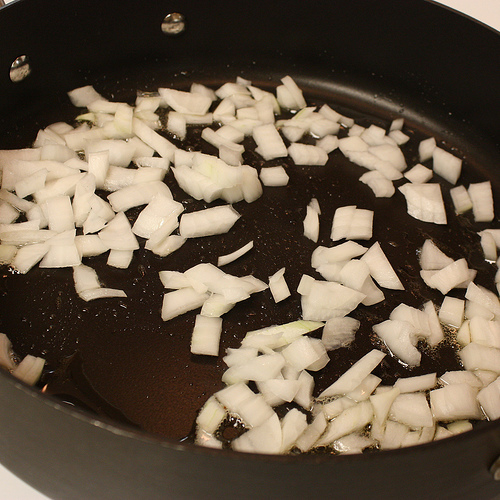 Throw the onion in a pan over medium-high heat with some oil of your choice. I used bacon grease, because… just yum. 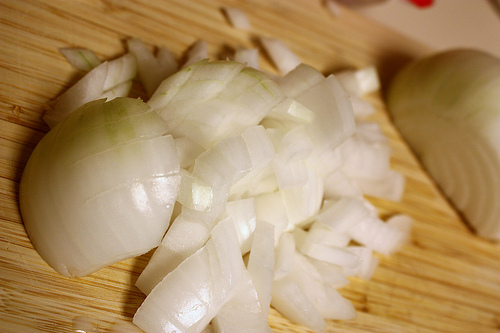 You’ll need to check on the onions and stir them every couple of minutes while you prepare the pork. …and brown sugar or real maple syrup. 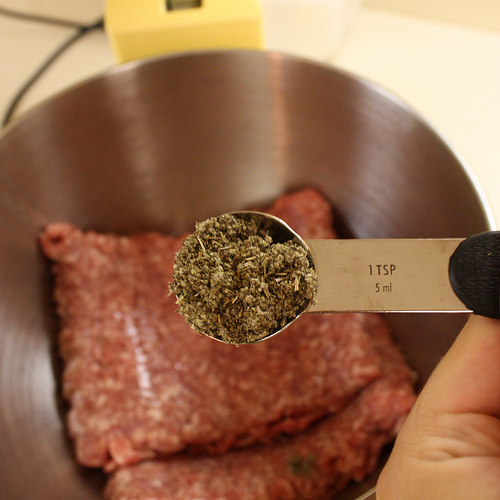 Keep in mind this one tablespoon is distributed over 2 pounds of meat. It’s not really sweet sausage. 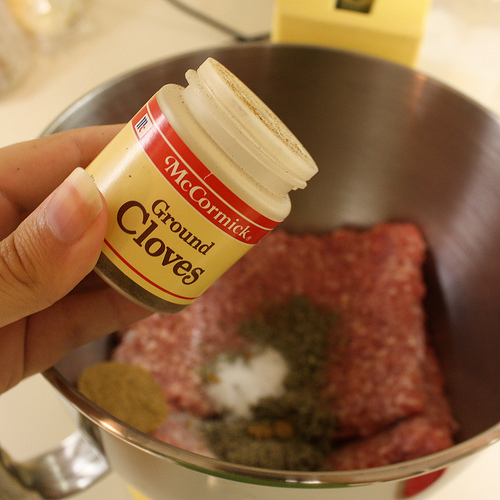 Then, sprinkle in some ground cloves, maybe 1/4 teaspoon. 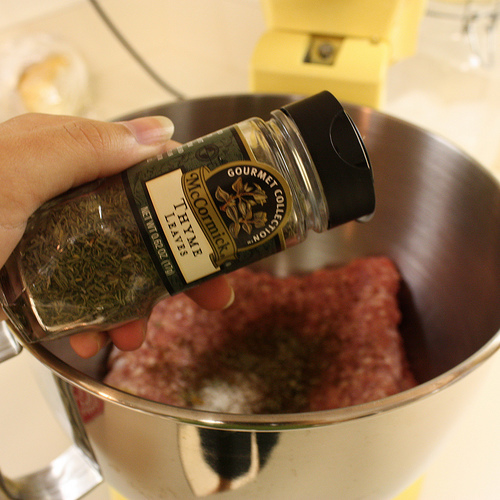 Then, add some thyme. Maybe 1/2 teaspoon but if you’re a fan you can add more. It’s your sausage. Whirrrrrr… mix it up. If you’re using your hands, that’s fine but they’ll get ukky. 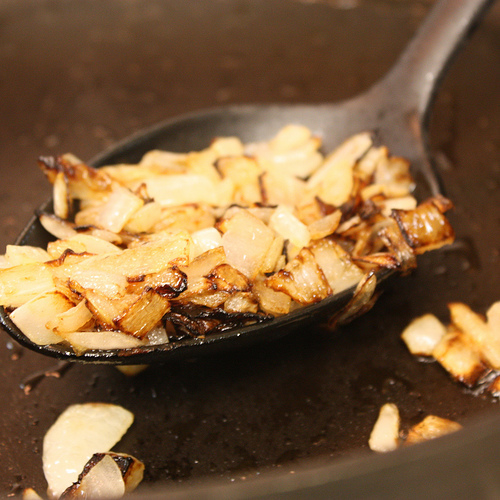 By now the onions should be deliciously caramelized. Scoop them up. 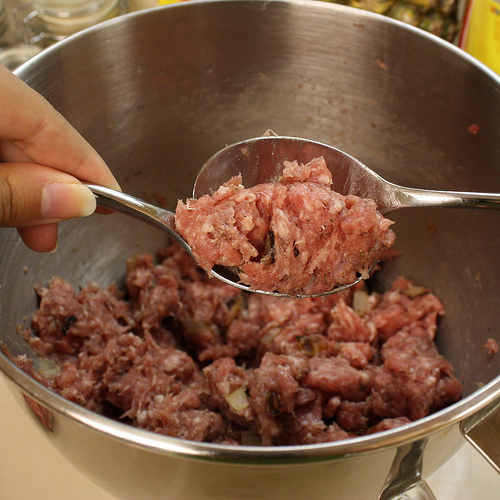 And throw them in the meat, then mix to combine. Now lay out a big piece of waxed paper if you’d like to make the balls all at once, or you can just throw chunks of it at your frying pan. I recommend the little ball-making approach. 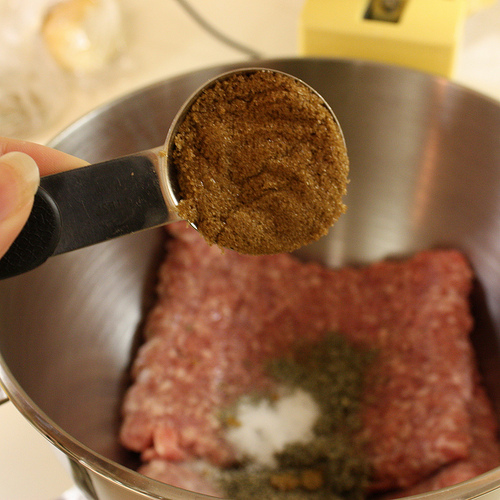 Just scoop some meat up with a tablespoon, then scrape it into another tablespoon, and repeat until the meat is vaguely football-shaped. Then place it on the waxed paper. Of course, if you want, you could use a cookie scoop, your hands, or whatever implements you favor. 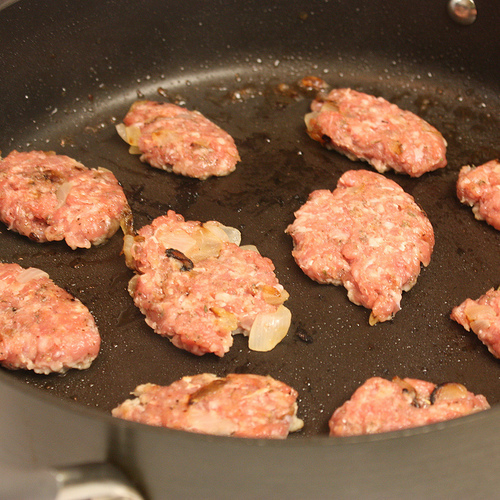 When you’re ready to start cooking, place the little footballs in your pan and flatten slightly. Cook on medium-high heat about 5 minutes on each side, or until the meat is totally cooked through. We don’t want to mess with undercooked pork. 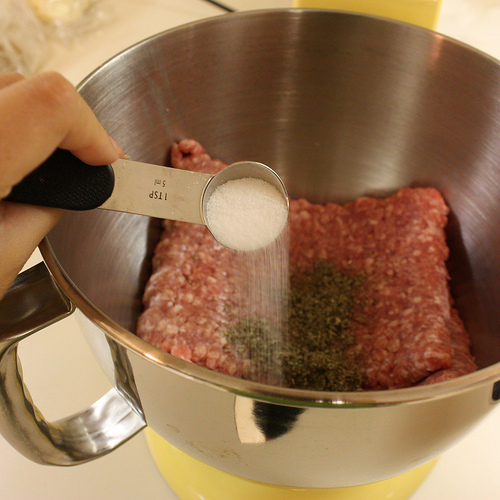 Paper towels will soak up the extra grease on the outsides of the sausage, but who are you kidding?You’re eating ground pork. I put a bunch of these in a tupperware in the fridge, and pulled out a few at a time for my breakfasts. I just warm them up (usually 3 pieces) for about 2 minutes and they’re good to go. Add some fruit and cottage cheese or an egg, and yum! In case you’re wondering, this recipe makes about 30 small patties. The nutritional information (per patty) is as follows. 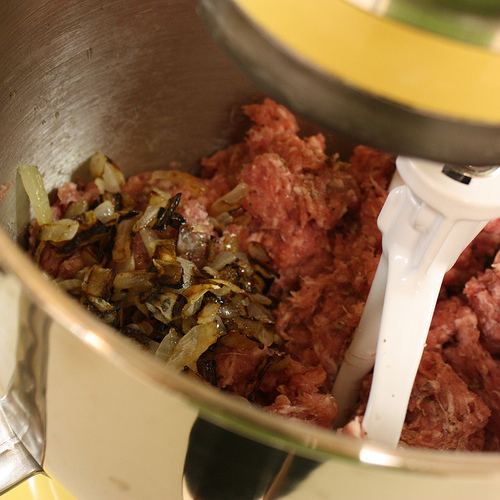 And, I decided to trim away all the fat from the pork, and not add in any extra back fat, to get a leaner sausage. I added everything except the cloves as i did not have those and it tasted like a chemical factory. The sage is just a nasty spice if you ask me. That looks freaking delicious and yay for real food! Im working in saudi arabia and pork in this area(country) is not in any of the stores. 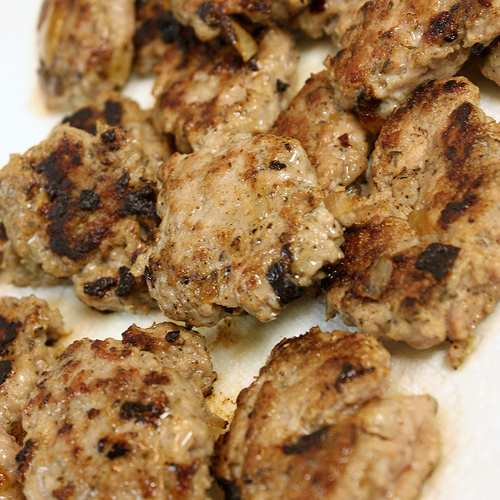 Looking for a recipe that uses ground turkey to make breakfast sausage. I do like mine with a little kick so ground red pepper maybe. Would recipe be good with turkey? Or there another recipe, and or meat sub I can use with out pork. 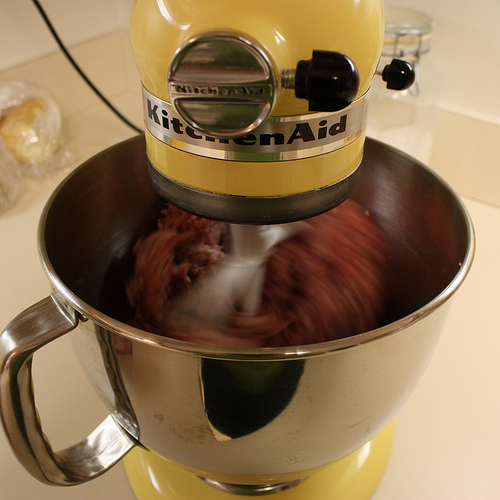 This gave me a chance to try out my new meat grinder. Used a combo of pork and beef, and used maple syrup instead of sugar (it's all I had!). These are so wonderful! Tonight I'm going to do some up with fresh mint and serve with tzatziki and a greek salad! Thanks for another winner! as im writing this the last 2 of mine are frying up. This recipe is SOOO good! i will definitely make them again (only smaller like yours cause i was scared mine werent cooked and ended up cutting most of them in half to be sure). I put in more syrup too cause i like sugar (what can i say lol). An amazing find! I'm not sure it matters. I've made it with ground pork which has a pretty high fat percentage and also with lean ground turkey and both turned out well. 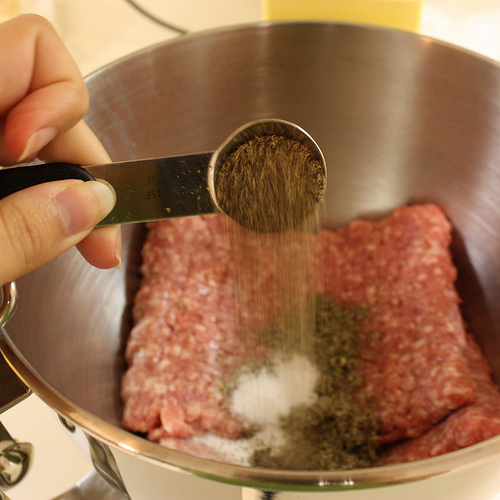 What fat percentage the ground meat is? This recipe is phenomenal! I can't get over how tasty this sausage is. I substituted 93/7 ground turkey for the pork, but followed the rest exactly. Thank you for sharing such a winner of a recipe! I’ll definitely be making more in the future — and will try a version with onions, too (love onions! ).